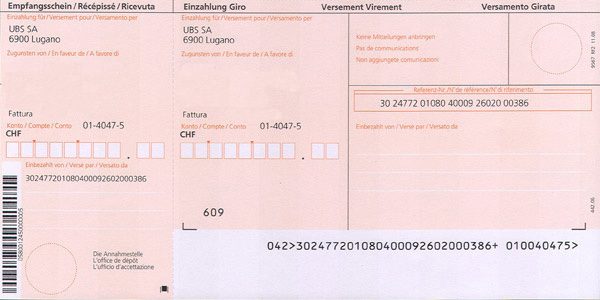 With this program you can print red inpayment slips (IS) and orange inpayment slips with reference number (ISR). Avoid your customers to fill the inpayment slip. Give a professional impression of you company. Single inpayment mode is the simpliest workflow, ideal to print a small amount of inpayment slips. 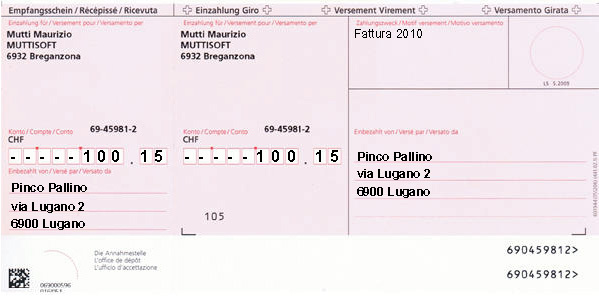 In this mode data for a single inpayment slip are input and printed, before to go on with the next one. 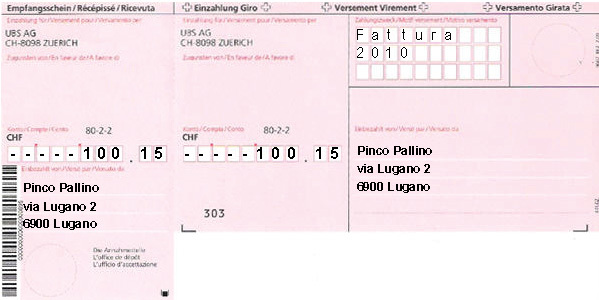 Inpayment list mode allow to input data for an unlimited number of inpayment slips and than print them all togheter with a single click. This mode is usefull in case of numerous inpayment slips to be sent more than once, for example to collect abbonments or rents. Is possible also to print a single inpayment slip from the list. Inpayment list mode is activate clicking on the list button. 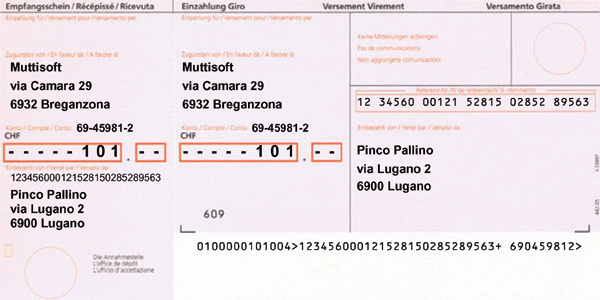 The software can print both red inpayment slips (IS) and orange inpayment slips with reference number (ISR). With every kind of inpayment splip, tamplates provided from different bank can be used; empty or prefilled. 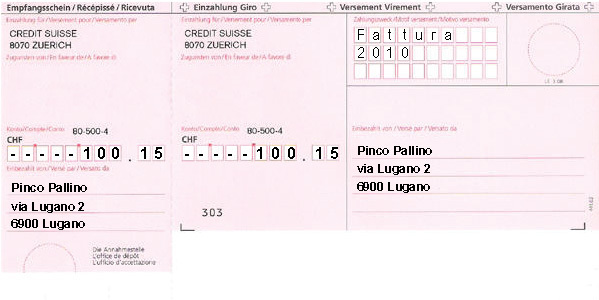 Inpayment prin supports the templates provided by UBS, Credit Suisse, Postfinance e Raiffeisen. In case you own some template which is not already supported, send us a scan via e-mail we will add this new template to the list. To zoom on the below pictures, click on them. Using Inpayment Print you can print also on preprinted inpayment slips provided by your bank. With a simple click, you can disable the print of the receiver data, this way only the sender data, amount and remarks will be printed. The software is compatible with Windows XP, Windows Vista e Windows 7, Windows 8 e Windows 10. 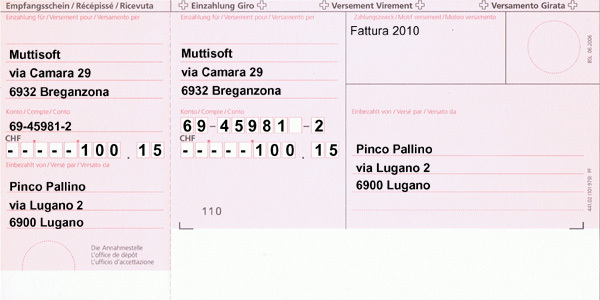 The software is completely translated in English and Italian. To symplify the input of the sender data, it is possible to copy and paste all the lines at once from Microsoft Word or Excel. You can copy an address composed from multiple lines and using the "paste all lines" button the fields header, adress 1 and address 2 will be filled at once. Every time you print an inpayment slip, the receiver data are automatically saved into the receivers registry. After that the previuos receivers can be picked up from a dropdown list, there will be no need to insert the receiver data twice. The receiver registry can be edited, adding or deleting entries. Every time you print an inpayment slip, the sender data are automatically saved into the senders registry. After that the previuos senders can be picked up from a dropdown list, there will be no need to insert the sender data twice. The sender registry can be edited, adding or deleting entries. Thanks to the automatic update feature, you will always run the latest version of the software on your computer. You will benefit of new features and bug fixes. Inpayment Print's license includes update for all the product life cicle. Using the button below, is possible to download Inpayment Print installation pack. Purchasing the software you will receive the serial number needed to complete the installation. Inpayment print's license include e-mail technical support, we will be glad to help you to solve any kind of problem you will encaunter using our products. We are always at your disposal to provide any further information and receive feedbacks that will allow us to improve our Inpayment Print. Contact us without hesitation, you will receive a quick answer, usually in less than 24 hours.